Other modalities that have been studied include DPL alone, CT, diagnostic laparoscopy, and ultrasonography or FAST (focused assessment with sonography for trauma). [5, 6] These strategies of selection for laparotomy are explored in greater detail below. Abdominal stab wound exploration forms part of a strategy developed by surgeons to allow a more selective approach. It is a safe, rapid, and cost-effective tool in the management of asymptomatic patients who present with an anterior abdominal stab wound. [7, 8] This approach has no place in the treatment of patients who are unstable, who have peritonitis, or who have evisceration. Patients with peritonitis and those who are hemodynamically unstable should undergo mandatory laparotomy. Only half of the wounds that penetrate the peritoneum cause damage that requires surgical intervention. [1, 9, 14] Abdominal stab wound exploration combined with further investigation, such as DPL or serial evaluation, achieves acceptable specificity rates. The organs most commonly injured with anterior abdominal stab wounds are the small bowel, the liver, and the colon. Missed hollow viscus injuries are associated with significant morbidity and mortality. Minimizing the time taken to control ongoing intraperitoneal contamination is critical in penetrating stab wounds, and local exploration is a valuable first step in speeding up the decision-making process. When combined with DPL, abdominal stab wound exploration allows significant injuries that are not immediately apparent to be identified early. Wound exploration can be performed successfully by surgeons or emergency department personnel, provided they are trained in the procedure. This strategy aids with patient flow through a busy emergency department. Abdominal stab wound exploration is indicated in a patient who presents with a stab wound to the anterior abdomen, normal vital signs, no signs of peritonitis, no evidence of evisceration (see the image below), and no other concurrent injury requiring laparotomy. Special circumstances involve patients with additional injuries that require operative intervention and cases in which the offending weapon or object is retained. If the patient has additional injuries that require operative intervention, a wound exploration may be performed in the operating room before the other procedure is commenced. If the object has been retained and the surgeon strongly suspects that the peritoneum has not been breached, the object may be removed in the operating room and the wound locally explored. In such cases, the surgeon should be prepared to immediately convert to laparotomy, if necessary. CT of abdomen and pelvis: Particularly in a male. No debate exists about the management of patients who are hemodynamically compromised or who exhibit peritonitis upon abdominal examination. These patients are immediately transferred to the operating room and undergo laparotomy. Another indication for further investigation or immediate laparotomy includes patients who are hemodynamically stable but have an unreliable clinical examination, such as those with brain or spinal cord injuries, and those who are intoxicated. Institutional approaches to stab wound evaluation are determined not only by patient physiological status, examination findings, and stab wound location, but also by staffing logistics, cost of investigation, and local experience. Each method has its merits and shortfalls, and combinations of techniques are not uncommon. The two most commonly used selective approaches are abdominal stab wound exploration (combined with DPL or serial clinical evaluation) and serial clinical evaluation. Results from the available studies show comparable patient outcomes. DPL was initially developed as a tool to help assess for intra-abdominal injury in patients who had sustained blunt trauma. Its value in penetrating trauma is accepted, but its application is less clear. No consensus exists concerning what constitutes a positive result, and protocols vary from one institution to the next. With less invasive technologies available, such as FAST examination, CT imaging, and laparoscopy, its role has been diminished. Prelavage aspiration of 10-20 mL of blood is generally accepted as a positive result. The lavage fluid is assessed for red blood cells, white blood cells, bile, feces, and vegetable matter. No threshold for DPL achieves 100% accuracy. The clinician must determine the relative weight of missed injury (false-negative findings) versus that of unnecessary laparotomy (false-positive findings). Up to 60% of visceral injuries involve the small bowel or colon. [1, 30] Injuries to these organs are still the leading cause of morbidity and mortality in patients with abdominal stab wounds. Surgeons are aware that the risk of morbidity and mortality of missed hollow visceral injury far outweighs that of unnecessary laparotomy; therefore, many have elected to lower their threshold for operative intervention. DPL is increasingly considered a quantitative assay that merely serves to provide further information to assist in decision-making and should no longer be used blindly with absolute cutoff values. The length of hospital stay in patients whose injuries are managed conservatively varies among institutions. One study showed that no significant injuries were discovered in any patients who were asymptomatic after 12 hours of observation. Most protocols, however, recommend evaluation of the patient over 24-72 hours. [20, 37, 38] The delay in laparotomy inherent in such an approach has not been associated with adverse outcome. This is, possibly, because most severe injuries are obvious early. Degree of contamination is likely more important than the delay in surgery, provided the delay is not excessive. However, few would argue with the principle that the time taken to control contamination should be minimized. Other methods of selection have been advocated, but few claim advantage over the two selective approaches discussed above. Some authors advocate DPL alone without prior local wound exploration as particularly useful in patients who are difficult to assess clinically because of drugs or alcohol or who are to be anesthetized for another procedure. A study successfully used a red blood cell lavage count of less than 1,000/μL as a criterion for immediate discharge from the emergency department. The authors claim that DPL is a simple procedure with few complications and that the complications, when they occur, are usually immediately evident. This view is certainly not shared by all. More recent studies assessing the performance of improved CT technology have found fewer missed hollow visceral injuries than previously reported. [49, 50] However, the inability to confidently exclude hollow visceral and diaphragm injuries is well documented. Serial clinical evaluation, when combined with CT scan, has been shown to be an effective strategy in the selective management of abdominal stab wounds. [49, 50] This approach is only suitable for well-staffed major centers with sufficient experience in abdominal stab wound management. A small study of 35 patients has suggested a role for fascial ultrasonography to detect fascial penetration in anterior abdominal stab wounds. As an investigation, fascial ultrasonography had a specificity and positive predictive value of 100%. Positive fascial ultrasonographic findings rule out the need for an abdominal stab wound exploration. Unfortunately, even in more experienced hands, fascial ultrasonography had a sensitivity of only 73%. The resultant drawback, therefore, is that negative fascial ultrasonographic findings do not adequately exclude an intra-abdominal injury, which requires further investigation or observation. Further assessment of the use of fascial ultrasonography may be justified. No meaningful change has occurred in decades in the suggested management of this important and growing group of patients. However, the combination of physical examination and other investigations has allowed a reduction in unnecessary intervention. Modern approaches have succeeded in limiting the mortality due to anterior abdominal stab wounds to as low as 0-3.6%. [1, 27] Selective approaches have achieved unnecessary laparotomy rates of less than 10%. [1, 7, 12, 16, 20, 27] In abdominal stab wounds, the morbidity rate of a laparotomy with negative findings is in the range of 1.5-8%. [27, 35, 57] Regrettably, a limited number of injuries are still missed. Further trials or, perhaps, technology may provide the next development in anterior abdominal stab wound management. Computerized penetrating injury prediction models have been retrospectively tested and compared. No single investigation or technological development is likely to provide all the information necessary to accurately determine which patients are likely to have injuries that require surgical intervention. Cayton CG, Nassoura ZE. Abdomen. Ivatury RR, Cayton CG. Textbook of Penetrating Trauma. Chap 24. Baltimore, Md: Williams & Wilkins; 1996. 281-99. Lee WC, Uddo JF Jr, Nance FC. Surgical judgment in the management of abdominal stab wounds. Utilizing clinical criteria from a 10-year experience. Ann Surg. 1984 May. 199(5):549-54. [Medline]. Shaftan GW. Indications for operation in abdominal trauma. Am J Surg. 1960 May. 99:657-64. [Medline]. Sanei B, Mahmoudieh M, Talebzadeh H, Shahabi Shahmiri S, Aghaei Z. Do patients with penetrating abdominal stab wounds require laparotomy?. Arch Trauma Res. 2013 Spring. 2(1):21-5. [Medline]. [Full Text]. Paydar S, Salahi R, Izadifard F, Jaafari Z, Abbasi HR, Eshraghian A, et al. Comparison of conservative management and laparotomy in the management of stable patients with abdominal stab wound. Am J Emerg Med. 2011 Nov 17. [Medline]. Berardoni NE, Kopelman TR, O'Neill PJ, August DL, Vail SJ, Pieri PG, et al. Use of computed tomography in the initial evaluation of anterior abdominal stab wounds. Am J Surg. 2011 Dec. 202(6):690-6. [Medline]. Feliciano DV, Bitondo CG, Steed G, Mattox KL, Burch JM, Jordan GL Jr. Five hundred open taps or lavages in patients with abdominal stab wounds. Am J Surg. 1984 Dec. 148(6):772-7. [Medline]. Cothren CC, Moore EE, Warren FA, Kashuk JL, Biffl WL, Johnson JL. Local wound exploration remains a valuable triage tool for the evaluation of anterior abdominal stab wounds. Am J Surg. 2009 Aug. 198(2):223-6. [Medline]. Leppäniemi AK, Voutilainen PE, Haapiainen RK. Indications for early mandatory laparotomy in abdominal stab wounds. Br J Surg. 1999 Jan. 86(1):76-80. [Medline]. Biffl WL, Kaups KL, Cothren CC, Brasel KJ, Dicker RA, Bullard MK. Management of patients with anterior abdominal stab wounds: a Western Trauma Association multicenter trial. J Trauma. 2009 May. 66(5):1294-301. [Medline]. Markovchick VJ, Moore EE, Moore J, Rosen P. Local wound exploration of anterior abdominal stab wounds. J Emerg Med. 1985. 2(4):287-91. [Medline]. Thal ER. Evaluation of peritoneal lavage and local exploration in lower chest and abdominal stab wounds. J Trauma. 1977 Aug. 17(8):642-8. [Medline]. Sugrue M, Balogh Z, Lynch J, Bardsley J, Sisson G, Weigelt J. Guidelines for the management of haemodynamically stable patients with stab wounds to the anterior abdomen. ANZ J Surg. 2007 Aug. 77(8):614-20. [Medline]. Barry P, Shakeshaft J, Studd R. Abdominal Injuries. Sherry E, Templeton J, Trieu L, eds. Trauma. New York: Oxford University; 2003. 213-26. Thal ER. Commentary. Ivatury RR, Cayton CG, eds. Textbook of Penetrating Trauma. Baltimore, Md: Williams & Wilkins; 1996. 307-8. Oreskovich MR, Carrico CJ. 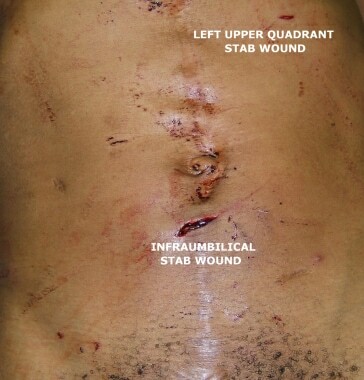 Stab wounds of the anterior abdomen. Analysis of a management plan using local wound exploration and quantitative peritoneal lavage. Ann Surg. 1983 Oct. 198(4):411-9. [Medline]. Burnweit CA, Thal ER. Significance of omental evisceration in abdominal stab wounds. Am J Surg. 1986 Dec. 152(6):670-3. [Medline]. Nagy K, Roberts R, Joseph K, An G, Barrett J. Evisceration after abdominal stab wounds: is laparotomy required?. J Trauma. 1999 Oct. 47(4):622-4; discussion 624-6. [Medline]. Nicholson K, Inaba K, Skiada D, Okoye O, Lam L, Grabo D, et al. Management of patients with evisceration after abdominal stab wounds. Am Surg. 2014 Oct. 80(10):984-8. [Medline]. Demetriades D, Rabinowitz B. Indications for operation in abdominal stab wounds. A prospective study of 651 patients. Ann Surg. 1987 Feb. 205(2):129-32. [Medline]. Arikan S, Kocakusak A, Yucel AF, Adas G. A prospective comparison of the selective observation and routine exploration methods for penetrating abdominal stab wounds with organ or omentum evisceration. J Trauma. 2005 Mar. 58(3):526-32. [Medline]. Como JJ, Bokhari F, Chiu WC, Duane TM, Holevar MR, Tandoh MA. Practice management guidelines for selective nonoperative management of penetrating abdominal trauma. J Trauma. 2010 Mar. 68(3):721-33. [Medline]. Bautz PC. Management of stab wounds in South Africa. ANZ J Surg. 2007 Aug. 77(8):611-2. [Medline]. Jansen JO, Inaba K, Rizoli SB, Boffard KD, Demetriades D. Selective non-operative management of penetrating abdominal injury in Great Britain and Ireland: Survey of practice. Injury. 2011 Apr 27. [Medline]. Rezende-Neto JB, Vieira HM Jr, Rodrigues Bde L, Rizoli S, Nascimento B, Fraga GP. 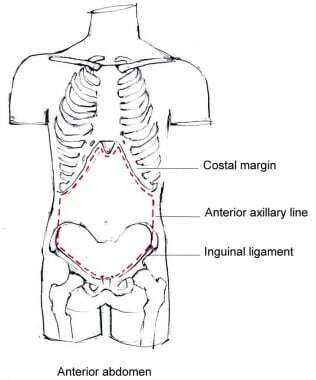 Management of stab wounds to the anterior abdominal wall. Rev Col Bras Cir. 2014 Jan-Feb. 41(1):75-9. [Medline]. Rosemurgy AS 2nd, Albrink MH, Olson SM, Sherman H, Albertini J, Kramer R. Abdominal stab wound protocol: prospective study documents applicability for widespread use. Am Surg. 1995 Feb. 61(2):112-6. [Medline]. Thompson JS, Moore EE, Van Duzer-Moore S, Moore JB, Galloway AC. The evolution of abdominal stab wound management. J Trauma. 1980 Jun. 20(6):478-84. [Medline]. American College of Surgeons. Abdominal Trauma. Advanced Trauma Life Support for Doctors: Student Course Manual. 6th ed. Chicago Ill: American College of Surgeons; 1997. 167. Gonzalez RP, Turk B, Falimirski ME, Holevar MR. Abdominal stab wounds: diagnostic peritoneal lavage criteria for emergency room discharge. J Trauma. 2001 Nov. 51(5):939-43. [Medline]. Wilson RF, Walt AJ. General Considerations in Abdominal Trauma. Wilson RF, Walt AJ, eds. Management of Trauma: Pitfalls and Practice. 2nd ed. Baltimore, Md: Williams & Wilkins; 1996. 411-31/20. Thacker LK, Parks J, Thal ER. Diagnostic peritoneal lavage: is 100,000 RBCs a valid figure for penetrating abdominal trauma?. J Trauma. 2007 Apr. 62(4):853-7. [Medline]. Nagy KK, Roberts RR, Joseph KT, Smith RF, An GC, Bokhari F. Experience with over 2500 diagnostic peritoneal lavages. Injury. 2000 Sep. 31(7):479-82. [Medline]. Cha JY, Kashuk JL, Sarin EL, Cothren CC, Johnson JL, Biffl WL. Diagnostic peritoneal lavage remains a valuable adjunct to modern imaging techniques. J Trauma. 2009 Aug. 67(2):330-4; discussion 334-6. [Medline]. Bull JC Jr, Mathewson C Jr. Exploratory laparotomy in patients with penetrating wounds of the abdomen. Am J Surg. 1968 Aug. 116(2):223-8. [Medline]. Alzamel HA, Cohn SM. When is it safe to discharge asymptomatic patients with abdominal stab wounds?. J Trauma. 2005 Mar. 58(3):523-5. [Medline]. Tsikitis V, Biffl WL, Majercik S, Harrington DT, Cioffi WG. Selective clinical management of anterior abdominal stab wounds. Am J Surg. 2004 Dec. 188(6):807-12. [Medline]. Navsaria PH, Berli JU, Edu S, Nicol AJ. Non-operative management of abdominal stab wounds--an analysis of 186 patients. S Afr J Surg. 2007 Nov. 45(4):128-30, 132. [Medline]. Clarke DL, Allorto NL, Thomson SR. An audit of failed non-operative management of abdominal stab wounds. Injury. 2010 May. 41(5):488-91. [Medline]. Martin RR, Burch JM, Richardson R, Mattox KL. Outcome for delayed operation of penetrating colon injuries. J Trauma. 1991 Dec. 31(12):1591-5. [Medline]. Plackett TP, Fleurat J, Putty B, Demetriades D, Plurad D. Selective nonoperative management of anterior abdominal stab wounds: 1992-2008. J Trauma. 2011 Feb. 70(2):408-13; discussion 413-4. [Medline]. Kindel T, Latchana N, Swaroop M, Chaudhry UI, Noria SF, Choron RL, et al. Laparoscopy in trauma: An overview of complications and related topics. Int J Crit Illn Inj Sci. 2015 Jul-Sep. 5 (3):196-205. [Medline]. Weinberg JA, Magnotti LJ, Edwards NM, Claridge JA, Minard G, Fabian TC. "Awake" laparoscopy for the evaluation of equivocal penetrating abdominal wounds. Injury. 2007 Jan. 38(1):60-4. [Medline]. Matsevych OY, Koto MZ, Motilall SR, Kumar N. The role of laparoscopy in management of stable patients with penetrating abdominal trauma and organ evisceration. J Trauma Acute Care Surg. 2016 Aug. 81 (2):307-11. [Medline]. Lin HF, Wu JM, Tu CC, Chen HA, Shih HC. Value of diagnostic and therapeutic laparoscopy for abdominal stab wounds. World J Surg. 2010 Jul. 34(7):1653-62. [Medline]. Leppäniemi A, Haapiainen R. Diagnostic laparoscopy in abdominal stab wounds: a prospective, randomized study. J Trauma. 2003 Oct. 55(4):636-45. [Medline]. Aragón GE, Eiseman B. Abdominal stab wounds: evaluation of sinography. J Trauma. 1976 Oct. 16(10):792-7. [Medline]. Demetriades D, Hadjizacharia P, Constantinou C, Brown C, Inaba K, Rhee P. Selective nonoperative management of penetrating abdominal solid organ injuries. Ann Surg. 2006 Oct. 244(4):620-8. [Medline]. Salim A, Sangthong B, Martin M, Brown C, Plurad D, Inaba K. Use of computed tomography in anterior abdominal stab wounds: results of a prospective study. Arch Surg. 2006 Aug. 141(8):745-50; discussion 750-2. [Medline]. Rehm CG, Sherman R, Hinz TW. The role of CT scan in evaluation for laparotomy in patients with stab wounds of the abdomen. J Trauma. 1989 Apr. 29(4):446-50. [Medline]. Soffer D, McKenney MG, Cohn S, Garcia-Roca R, Namias N, Schulman C. A prospective evaluation of ultrasonography for the diagnosis of penetrating torso injury. J Trauma. 2004 May. 56(5):953-7; discussion 957-9. [Medline]. Blackbourne LH, Soffer D, McKenney M, Amortegui J, Schulman CI, Crookes B. Secondary ultrasound examination increases the sensitivity of the FAST exam in blunt trauma. J Trauma. 2004 Nov. 57(5):934-8. [Medline]. Udobi KF, Rodriguez A, Chiu WC, Scalea TM. Role of ultrasonography in penetrating abdominal trauma: a prospective clinical study. J Trauma. 2001 Mar. 50(3):475-9. [Medline]. Murphy JT, Hall J, Provost D. Fascial ultrasound for evaluation of anterior abdominal stab wound injury. J Trauma. 2005 Oct. 59(4):843-6. [Medline]. Ertekin C, Yanar H, Taviloglu K, Güloglu R, Alimoglu O. Unnecessary laparotomy by using physical examination and different diagnostic modalities for penetrating abdominal stab wounds. Emerg Med J. 2005 Nov. 22(11):790-4. [Medline]. Petersen SR, Sheldon GF. Morbidity of a negative finding at laparotomy in abdominal trauma. Surg Gynecol Obstet. 1979 Jan. 148(1):23-6. [Medline]. Ertan T, Sevim Y, Sarigoz T, Topuz O, Tastan B. Benefits of CT tractography in evaluation of anterior abdominal stab wounds. Am J Emerg Med. 2015 Sep. 33 (9):1188-90. [Medline]. Ahmed BA, Matheny ME, Rice PL, Clarke JR, Ogunyemi OI. A comparison of methods for assessing penetrating trauma on retrospective multi-center data. J Biomed Inform. 2009 Apr. 42(2):308-16. [Medline].